'It's a horrible feeling' - What do Europeans in the West Country think about Brexit? With just 24 hours until MPs are set to vote on the Prime Minister's Brexit deal, millions of EU nationals living in the UK face an anxious wait to find out what the future holds. The Government has promised people who are here legally that their rights will not be affected. But Europeans living in the Westcountry have told ITV the official guidance has left them feeling confused and unwanted. 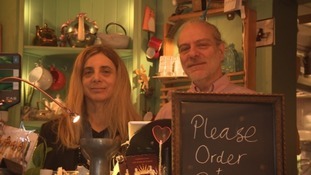 Husband and wife Bianca and Massimo, originally from Italy, run a small restaurant in the centre of Totnes. In order to stay in the UK they will have to apply for 'settled status' by 2021. It's been a really, really horrible feeling, because all of a sudden you really realise somehow that you are not welcome. I'm very sorry. At the beginning I was very angry, I want to live in this country, I want to stay here. I fought all my life as a human being to create a European Union. But I'm sorry for this country now. According to the latest figures from the Office for National Statistics, there are around 19,000 EU nationals living in Cornwall, 18,000 in Devon, 10,000 in Plymouth and 5,000 in Torbay. There are 24,000 EU nationals living in Wiltshire, 27,000 living in Gloucestershire, 39,000 in Somerset,12,000 in Dorset and 39,000 in Bristol and BANES'. Most of them will need to apply to stay in the UK after 2021, a process which will cost 65 pounds for adults and 32 pounds for children. The Government has promised to protect the rights of EU nationals after Brexit - but it will all depend on how long they have lived here. Carmine, who runs an Italian cafe in Bristol, came to England with his family because it seemed a tolerant country where they could prosper. But since 2016 and the country's decision to leave the European Union, uncertainty over the family's future has crept in. I don't know, let's see. I hope that they change their mind. Maybe the Government, or the people, or Theresa May understands that this is not the right way and maybe stop it. Because I believe people understand better what the problem is and where we are going with Brexit. Sixteen years after arriving in the UK, photographer and artist Marielle is a firm fixture in her local community in South East Cornwall. But Brexit has prompted her to re-examine her own identity. I never really felt like an immigrant at all, but since the Brexit vote - not that other people view me as an immigrant, but I view myself as an immigrant if that makes sense. I mean I still love England, I think it's a fantastic country to be able to live in. I just feel really worried and sad that it's divided the nation. The EU Settlement Scheme will open fully by 30 March 2019. The deadline for applying will be 30 June 2021. The fee to apply will be £65 if you’re 16 or over and £32.50 if you’re under 16. It will be free to apply if you have indefinite leave to remain in or enter the UK and want to change this to settled status; you have a valid ‘UK permanent residence document’; you’re applying from April 2019 to move from pre-settled status to settled status; or you’re a child in local authority care.